SweetHome Review 2019: Is SweetHome a Good Hosting? Established in 1998, SweetHome has, over the years, become the go-to hosting services provider in Israel for individuals and organizations. The company provides several hosting options including Windows Hosting, Linux Hosting, and Cloud Computing. 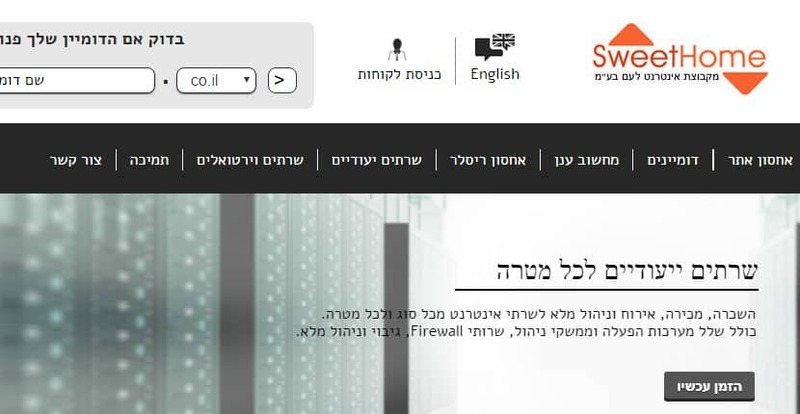 SweetHome is one of the leading web hosting companies in Israel. This Israeli company has been providing hosting solutions to individuals and organizations since 1998. Today, the website hosting vendor uses top-of-the-range cloud infrastructures to provide these services to thousands of customers. SweetHome now hosts tens of thousands of websites in its IBM and VMWare technology servers. The website is available in Hebrew and English, and its support team provides technical support in English, Hebrew, and Russian. After two decades of proven hosting solutions for individuals and organizations, SweetHome has perfected the art. The company provides several hosting options, including Windows Hosting, Linux Hosting, and Cloud Computing. Other hosting solutions include Virtual Servers, Dedicated Servers, and Reseller Storage package. Both the Windows Hosting and Linux Hosting packages come with a free package. The basic Linux Hosting option is perfect for image websites and private websites. It fully supports open source applications like Drupal and WordPress and comes with an installation manager. The Windows Hosting package has Windows Private, Windows Basic, and Windows Pro plans. The Windows Private plan includes 1GB disk space, 100GB traffic every month and up to 10 domains per account. This option is suitable for private and corporate websites that use MySQL / MS-Access / MS-SQL 2012 and NET4 / Asp. The Windows Basic, on the other hand, includes 250GB monthly traffic, 3GB disk space, and up to 25 domains for every account. It is perfect for dynamic .NET / SQL websites. SweetHome’s data center is located in Petah, Tikva, on Bezeq International’s server farm. The powerful and secure server is SweetHome’s guarantee of high availability to every website they host. The company has also made a lot of effort to ensure that their hosting platform is sufficiently straightforward for ease of use by beginners and experts alike. The ease of using these SweetHome solutions has endeared the company to many people and organizations in Israel and beyond. SweetHome is quite competitive in the Israeli market. All the hosting plans by this vendor include a free Israeli or international domain for the first year. Additionally, SweetHome offers promotional offers especially for customers who buy annual subscriptions. SweetHome offers no free version for any of its website hosting packages, neither does it offer a free trial version. Switching from one hosting plan to the other is pretty straightforward and can be completed with a few clicks. SweetHome’s support team is available to help the company’s customers with any technical issue with the hosting that arises. The company has also created a resourceful support page on their website with a variety of documents to help customers set up and use SweetHome’s hosting solutions. The support team is available 24/7 all year round. That said, SweetHome’s support team only deals with infrastructure related issues after office hours. Any other hosting issue has to wait for the next business day. The company, therefore, discourages its customers from performing upgrade or maintenance work that might require their input outside business hours. My conversations with this vendor’s support team were helpful and their responsiveness impressed me. SweetHome seems to live up to its commitment of offering excellent hosting services for individuals and businesses in Israel and beyond. Its resourceful support page and knowledgeable support team may be the main reasons thousands of users prefer SweetHome’s hosting services. Wondering how SweetHome stacks up against other Web Hosting companies? Enter any other Web Hosting company and we will give you a side-by-side comparison.